Friday April 11 1884 It was a pleasant day and we hired the washing done. The clothes got dry so I ironed most of them in the afternoon. Mrs Hudson and Kitty called to see Rob his cough seems some-what better I was too tired to do any thing in the evening. 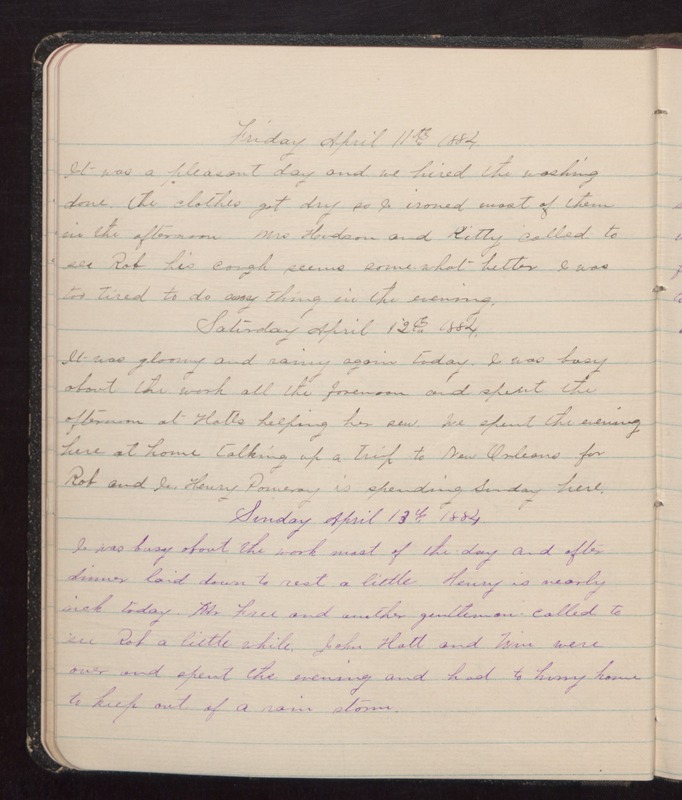 Saturday April 12 1884 It was gloomy and rainy again today. I was busy about the work all the forenoon and spent the afternoon at Hatts helping her sew. We spent the evening here at home talking up a trip to New Orleans for Rob and I. Henry Pomeroy is spending Sunday here. Sunday April 13 1884 I was busy about the work most of the day and after dinner laid down to rest a little. Henry is nearly sick today. Mr Free and another gentleman called to see Rob a little while. John, Hatt and Win were over and spent the evening and had to hurry home to keep out of a rain storm.